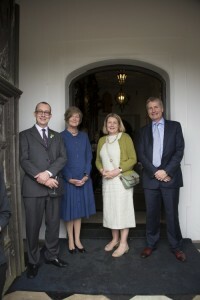 The first ever six Chartered Horticulturists were announced at the Garden Party; Leigh Morris C Hort FCIHort – (President); Andrew Gill C Hort FCIHort – (President-Elect); Heather Barrett-Mold C Hort FCIHort (Past President and Education Sector Representative); Dennis Clarke C Hort FCIHort – (Honorary Secretary), Owen Doyle C Hort FCIHort – (Chair Membership Action Group); and John Whetman. C Hort FCIHort – (Honorary Treasurer). Lady Salisbury presented certificates to the Chartered Horticulturists; Andrew Gill, Heather Barrett-Mold, and Dennis Clarke. At the Garden Party, Andrew Gill C Hort FCIHort, President-Elect said “This is indeed a momentous day for the Institute and a great way to celebrate the Institute’s 30th birthday. The Institute’s aim is to further professionalise horticulture. 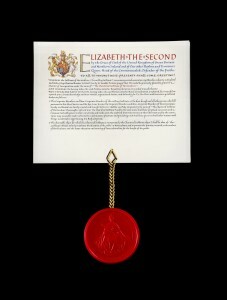 Members are now members of an Institute which holds the recognition and benefits of Chartered status. Whilst that itself lends gravitas, kudos and prestige to their position, the Institute now has the ability to award individual Chartered status. For those members who choose to apply for and become individually Chartered their Chartership can support them in their professional lives, for example increasing their attractiveness to potential employers and enhance their status with existing employers. After the event The Marchioness of Salisbury said:It was a great honour to have been asked to unveil the Royal Charter at the Garden Party on Monday. At least two hundred guests made the effort to come and celebrate, many very distinguished, and all interesting and busy people. They came from every corner of the British Isles so we should all feel confident of the future of the Chartered Institute of Horticulture. Our last guest, Lord Taylor of Holbeach FCIHort, the new Chief Whip in the House of Lords, whilst delayed on route to the celebrations, made a tremendous effort and was greeted by many friends and colleagues. An enjoyable end to a lovely afternoon. Congratulations on all those who helped organise the party”.